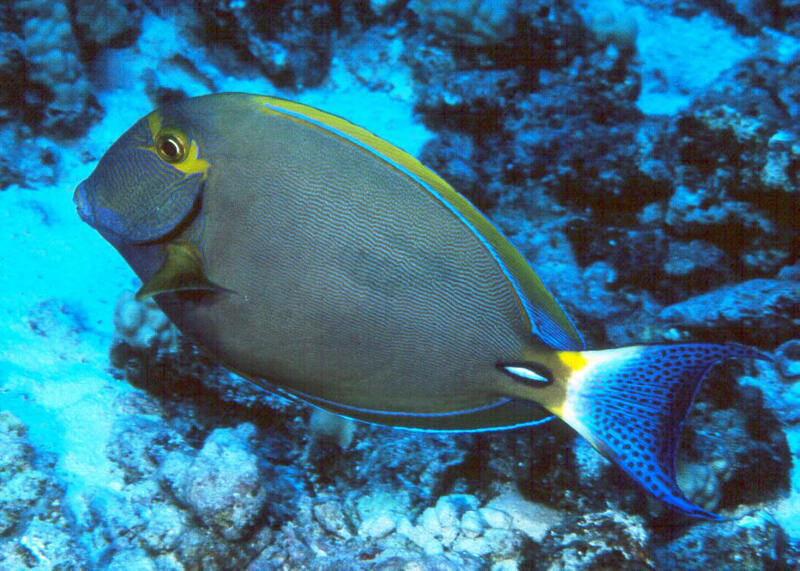 Acanthurus dussumieri Valenciennes 1835, the Eyestripe or Dussumier's Surgeonfish. 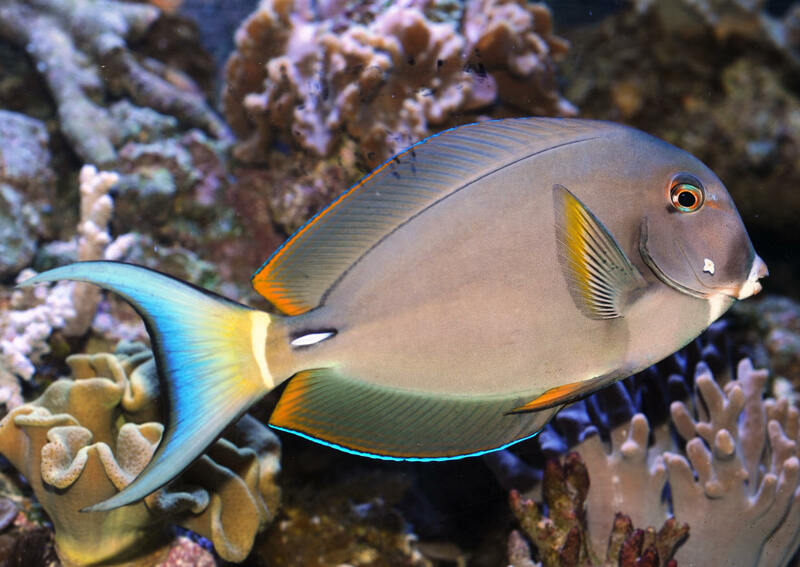 This is a highly variably colored fish. Some are drab gray, whereas some I've seen from Hawai'i sported brilliant yellow around their body margin with beautiful royal purple highlights. This surgeon is more like the genus Ctenochaetus in its feeding habits, sifting sand and detritus in addition to algae scraping. To eighteen inches long in the wild. A juv. in captivity. 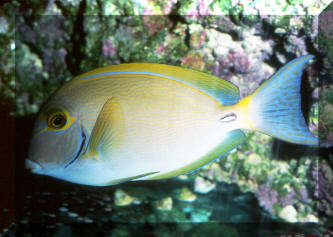 Acanthurus dussumieri Valenciennes 1835, the Eyestripe or Dussumier's Surgeonfish. 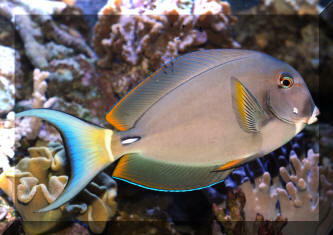 This is a highly variably colored fish. Some are drab gray, whereas some I've seen from Hawai'i sported brilliant yellow around their body margin with beautiful royal purple highlights. This surgeon is more like the genus Ctenochaetus in its feeding habits, sifting sand and detritus in addition to algae scraping. To eighteen inches long in the wild. An adult off Maui, Hawaii, USA. 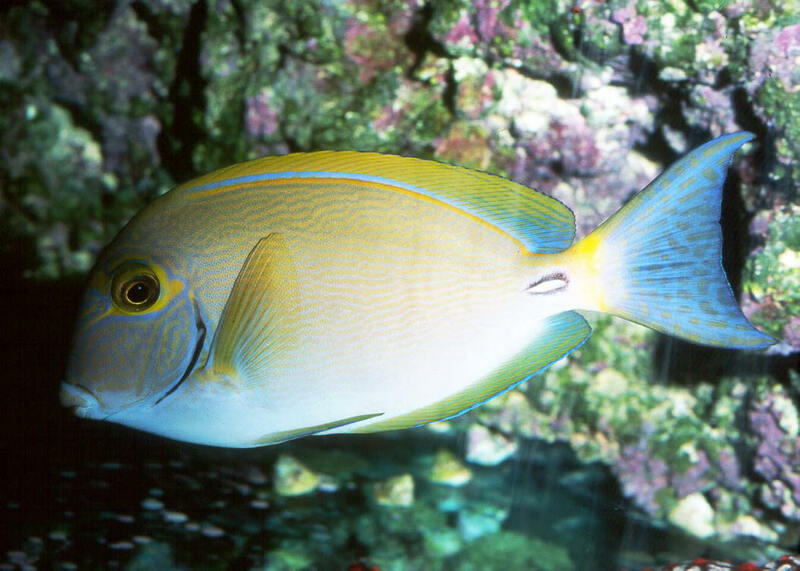 Acanthurus fowleri de Beaufort 1951. 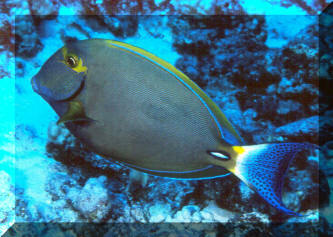 Fowler's Surgeonfish. Western Pacific: Philippines, Indonesia, Papua New Guinea, Solomon Islands, and off northwestern Australia. To: 45 cm. A later juv. in captivity. 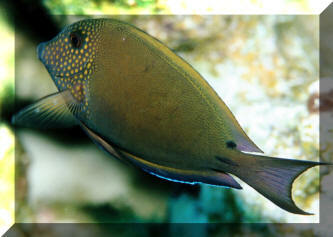 Acanthurus nigrofuscus (Forsskal 1775), the blackish Brown or Spot-Cheeked Surgeonfish. Manageable size (to eight inches), and moderate behavior toward other fishes qualify the Brown Tang as a desirable aquarium species especially as an algae controller. Unfortunately it is a rather plain fish. Red Sea image.